Mila is wonderful!! She met us at our hotel and took us each place in Florence we had planned to visit. She is extremely knowledgeable and was so patient. We saw all the highlights and she explained the history. Extremely interesting and Mila is a delight! I highly recommend her! TOUR GUIDE RESPONSE: Thank so much! It was a pleasure for me to meet you and I really hope to see you again in the future. All the best, with all my heart! Mila was a great guide. She knows Florence very well and her information on the David was extremely insightful! Our group bonded with her and were extremely pleased with the tour she provided. TOUR GUIDE RESPONSE: Thanks so much. For me, it was a real pleasure to be your guide and I hope to see you again in the future. All the best! Mila was a lovely, energetic, organized, and informative guide. Our group four adults all had an interest in history, art, and culture, but not a great depth of knowledge. Mila's descriptions brought it all together so that during our brief time in Florence every site and piece of artwork had relevance and we were able to appreciate each one in a meaningful way. Mila ushered us through the crowds and was especially considerate of our daughter-in-law who is expecting a baby in 3 months. Thank you, Mila! Mila organized an absolutely perfect day for our group. The winery visit was just right and the lunch location superb. This day was one of our favorites of the entire trip. We have a very insightful and informative tour of the highlights of Florence. Mila gave us tons of practical information to allow us to maximize the limited time we had in the city. She very knowledgeable, affable and flexible; well equipped and expertly organised. She has a strong network among the industry people in Florence and that certainly helps save time during the tour. Highly recommended! Thank you Mila for going above and beyond to accommodate us. We enjoyed meeting you and appreciated both your knowledge of your beautiful home city and your kindness. Mila saved the day! My granddaughter and her friend missed their flight from Chicago. They were able to rebook the following day. On very short notice Mila arranged pick up in Rome and transported Megan and Corey to Florence in time to join the rest of our family for lunch and the rest of the tour which included Pisa. We are very appreciative of the effort and personal attention Mila provided. She corresponded with my daughter Maria from Rome and from our ship and made this last minute arrangement. Great day with Mila. Incredible knowledge of all that Florence has to offer!!! We fell in love with Florence, Italy. Having Mila as our guide was key to our great day. She got us in to all the important places without waiting in lines, she helped me negotiate prices on leather in the market and she showed us one of the most beautiful cities in the world. Thank you Mila and Ricardo our great driver. I would highly recommend this excursion and Mila. TOUR GUIDE RESPONSE: Thanks so much for your feedback. For me and Ricardo it was more than a pleasure to meet you. And during the time spent with you, I was sure nobody would hurt me! Hope to see you again in the future and a million of kisses to your kids! All the best. My mother and I were visiting Florence for the first time and had a lovely tour with Mila. She was very sweet and knowledgeable about art history and Florence history. We thoroughly enjoyed our time with her. TOUR GUIDE RESPONSE: Hi! I am so happy to hear you enjoyed the tour in Florence! For me, it was wonderful to spend some time with you and I wish you all the best. Mila was very knowledgeable. She takes the time to technically explain the art and tell its story. There were 8 of us and she was very patient, almost effortlessly getting us to where we needed to go. If your time in Florence is limited and you want to see the artistic highlights this is the tour dor you. Thanks Mila! We enjoyed our time with Mila. We went to Lucca - a walking city, and though she walked a bit too fast for some of the group who have difficulty walking, for most, it was an interesting city with some unique sites. 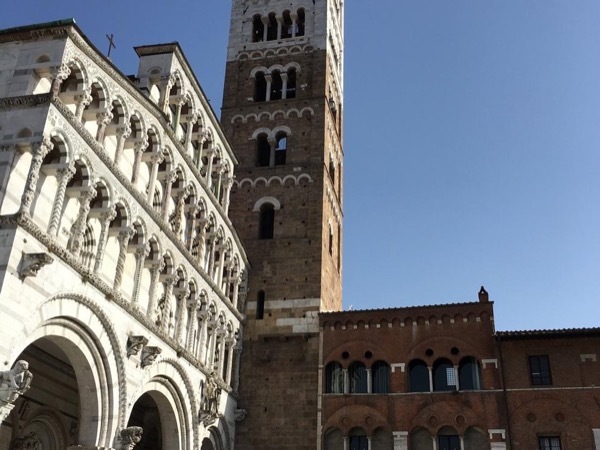 We went to Pisa from there and thoroughly enjoyed Pisa with time to have lunch and for those who wished, time to climb the leaning tower. TOUR GUIDE RESPONSE: I am really happy you enjoyed the walking tour in Lucca and I hope to meet you again in the next future. I wish you all the best! Thanks so much! Our entire family loved our time with Mila, we told her we wanted to hit all the highlights in Florence and we did. She has a ton of energy and vast knowledge of art history, and she made it very engaging for our 10 year old son. We felt like this investment in a private tour guide was well worth it for our short time in Florence. TOUR GUIDE RESPONSE: Thanks so much. It was a true pleasure for me to meet you all and I really hope to see you again in the next future. All the best! TOUR GUIDE RESPONSE: Thanks so much! I wish you all the best and hope to see you in the future! Mila was well-prepared for being soft spoken in crowded places, is very knowledgeable, probably best for guests over 20 years old. She keeps her guests' safety in mind and is helpful for special needs. Grazie mille. We did the city walking tour with Mila. It included the academia gallery, Duomo, important piazzas and of course the Uffitzi museum. She was super nice, on time, very very passionate about her work, super knowledgeable in art history, very accomedating and she never made us feel rushed for a second. She made sure that we enjoy her city and have the best experience ever. She also offered us great recommendations for other sightseeing, shopping and dining experiences. Mila met us right on time at the specified location. She was extremely knowledgeable and very very nice. I would recommend her tour to anyone. Thank you Mila! Our tour guide was efficient and knowledgeable. We told her what our time schedule was and our interests, and she fashioned the tour accordingly. We spend 2 awesome days with Mila to get the best of Florence in such a short time. It was great . Mila is very knowledgeable, kind, easy going and very passionate about history and art. We fall in love with this beautiful city. If you are looking for a private local guide- Mila is the ONE, highly recommend. TOUR GUIDE RESPONSE: Thanks so much! I wait for you in the next future. All the best! Mila was our guide for the tour in Florence Italy for the Clinesmith family of eight on May 20, 2017. The van, driver, and guide were prearranged through Tours by Locals, and we were very pleased. After the tour Mila said goodbye, and the driver took us to see the Leaning Tower of Pisa, then back to our cruise ship. We enjoyed a perfect walking tour in Florence. Mila provided great knowledge and narrative to help us understand the city. We highly recommend. TOUR GUIDE RESPONSE: It was a true pleasure to meet you and show you some corners of my town. I wish you all the best and hope to see you again in the future. Thanks so much. Mila was very knowledgeable, interesting, fluent in English,and very accommodating. I would have no hesitation in recommending her. TOUR GUIDE RESPONSE: Thanks a lot. I hope you had a pleasant travel to Venice and you found some nice thing for your wonderful Baby! Have a lovely day. Short and sweet (just 1 hour) and still very informative even though we had been to the Accademia twice in the past. Mila was very knowledgeable and friendly. Recommended! TOUR GUIDE RESPONSE: Thanks so much. I am so happy to hear you enjoyed our tour and I wish you all the best! Mila was a fantastico tour guide. She gave a lot of interesting and informative information. She accommodated the tour to what we wanted to see and learn about. She was friendly and made sure we understood what she was saying. She gave a great suggestion for a perfect place to eat lunch which was perfecto! We enjoyed our tour of Florence and Pisa with Mila. We would recommend her and tours by locals. Grazie. TOUR GUIDE RESPONSE: Thanks so much for your review. It was a true pleasure to meet you all. You are a fantastic family and I really hope to meet you again in the future! I wish you all the best. Grazie mille! Very knowledgable and accommodating to the need of clients. Highly recommended. Had a great day with Mia! We enjoyed our customized tour very much! TOUR GUIDE RESPONSE: Hi! how are you? I am so happy to hear back from you and see you enjoyed the time with me. I really hope to see you again in the future and I wish you all the best! Thanks a lot. Very knowledgeable guide who involved our 12 year old son quite well. This was a very worthwhile 4 hour tour of Florence - exactly what we wanted. Thanks Mila. Mila was lovely! We learned so much about Leonardo DeVinchi at his home and museum - he was truly very brilliant. Pisa was worth the drive and the pizza we had excellant! We were picked up on time from the ship and driven to Florence with 1 stop overlooking the CBD. Mila met us and was very friendly and knowledgeable but her English was difficult to understand. There was a little misunderstanding about what we wanted to do - no shopping, see sculptures! Went to Pisa on way home. We had no idea Pisa was more than just the leaning tower. We could have spent much more time there - although we were certainly not rushed. A good day but probably could have been better. Mila is a sweet and very knowledgeable tour guide. We toured Florence with her, and she was extremely accommodating since the tour was to take place in the morning and we did not arrive until afternoon. She took us all around the city and through the major museums and the Duomo. She was extremely interesting and we had a wonderful time and we learned so much with her! Mila is fun, enthusiastic, knowledgeable, charismatic. I recommend Mila to be anyone's tour guide. Her vast knowledge of Florence's history sets her apart from any other tour guide in the city. We had and incredible time with Mila and no doubt I will request her again when I return to Florence. My whole family really enjoyed our time with Mila. She prepared well for our time together, including making reservations for the museums we wanted to see and providing restaurant recommendations. Mila met us at our AirBnB apartment for our tour, and was very informative, responsive and engaged throughout the day. She really knows her stuff! Thanks Mila for a day we will never forget. Mila was a fantastic guide in Florence. She was friendly with museum staff and was able to deftly negotiate the lines. She was flexible, allowing us to stop for coffee and adjust the tour. Her city and monument knowledge was excellent, but it was as if we toured the art museums with a professor of art history. Mila was able to give us detailed information including composition, symbolism, political influences and how artists' personalities played a role in their works. TOUR GUIDE RESPONSE: Thanks so much for your words! I was really happy to meet you and spend some time together. And with all my heart I hope to see you again in the next future. All the best! Mila was our first experience with TBL, and she couldn't have been a better representative. With just one day in Florence, we wanted to cram as much as we could into our short time. Mila met us at the train station, adjusted her schedule to meet ours, and proceeded to give us a thorough and well-constructed tour of the highlights of Florence. She is not only delightful personally, but extremely knowledgable about Florentine history, art and architecture. We really enjoyed her, and recommend her highly. We were picked up at our cruise ship by Ricardo. He was a lovely man who took us to Pisa and Florence where we met up with our guide Mila. Once in Florence Mila took us on a lovely walking tour. It was an excellent tour. TOUR GUIDE RESPONSE: Thanks so much for your review! Enjoy some relaxing days in the beautiful Nice and have a lovely travel back. I really hope to see you again and I wish you all the best! It was wonderful to have Mila share with us the important pieces of art in the Uffizi and the nearby Florence area. TOUR GUIDE RESPONSE: Thanks so much for your comment! For me, it was a true pleasure meeting you and I really hope you enjoyed your holiday in Tuscany. All the best! Mila provided a informative and interesting and fun overview of the most important sites in Florence. Even though we have visited many of the same sites before, Mila was able to give us even more perspective and history. A visit to Florence without this overview would not be as interesting and fun. TOUR GUIDE RESPONSE: Thanks a lot for your feedback! I hope you come back once more here, so that we can meet again. All the best! Mila was great. She took us around the city and explained everything in great detail. She has great passion for the art & culture of the city, you can tell by the way she spoke about it. TOUR GUIDE RESPONSE: Thanks so much! Mila was an EXCELLENT tour guide. My family of 4 (19 and 22 year old daughters) toured the Academia and Uffizi, and saw many of the highlights of Florence over the course of 7 hours with Mila. She was so knowledgeable about the artists and the politics that inpired much of the art and architcture of this beautiful city. We were so impressedwith her depth of knowledge and attention to detail. Mila was very professional, funny, charming, and efficient with our time. Outstanding service! We would give Mila a ten out of ten, she was fantastic! Very kind to our 9 year old daughter. TOUR GUIDE RESPONSE: Thanks so much for your feedback! Your daughter was so lovely and behaved in a fantastic way! I am more than happy to hear you enjoyed the tour and hope to see you again. I wish you all the best! Mila was terrific! We thoroughly enjoyed our tour with her and recommend her to anyone interested in Florence art. We visited the Accademia, Uffizi Gallery, and the Duomo. Her knowledge of the art we saw is extensive and she described it very well. She also pointed out several other interesting landmarks during our tour and made very good suggestions for lunch. Our only regret is we didn't have more time to spend with her. Great Job. TOUR GUIDE RESPONSE: Thanks so much for your feedback! It was fantastic to meet you and spend some hours together. I really hope you come back here in the future and I wish you all the best for your lives. Let's keep in touch! Mila was great. Met us on time, pointed out incidentals of interest while walking from one attraction to another, giving us the "flavors" of Florence culture. Very knowledgable about Florentine history and art. Made our one day in Florence very memorable. TOUR GUIDE RESPONSE: That's very kind from you. Thanks a lot for your feedback. I really hope to see you again and I wish you all the best! Mila is lovely guide, she is knowledgeable & very friendly. We had a wonderful time with her. TOUR GUIDE RESPONSE: That's wonderful! Thanks so much for you feedback and please a million of kisses to your lovely kids! I wish you all the best. What a thoroughly enjoyable day in Florence with Mila. We were very impressed with her vast knowledge of Florence both past and present and learned a tremendous amount about this fascinating city. Mila planned the day to perfection and made sure we saw as much as we could. I can't imagine anyone doing a better job of showing us the true Florence than Mila. TOUR GUIDE RESPONSE: Thanks so much! Your feedback is fantastic and I am so happy you enjoyed the day in Florence. If you come back, it would be wonderful to meet you again! All the best! Hi We give the tour we received by Mila 5 stars. She was very prompt, courteous and willing to show us whatever we requested. The best part about booking the tour was immediate entry into the Academia museum and also the duomo. ���� Mila recommended excellent restaurants and even made the reservations for us. TOUR GUIDE RESPONSE: Thanks so much for your wonderful feedback! I really hope to see you again in the next future. All the best! Mila was an excellent and informative guide for Florence. We enjoyed her deep knowledge of art and history and FLorentine culture. She is an excellent choice if you are looking for a guide who can help you see the highlights of Florence in a day tour. Mila was incredible because of her flexibility, knowledge and insights. We'd arranged to tour Florence with her on the morning of May 19 and 20. We visited a lot of the sites we had on the agenda for May 20 on our own on May 18. Mila just called an audible, throw out the agenda, and made a new one up on the fly. She was great at putting things in context as they related to the times, the politics, the economy and what was happening in society. Her in depth understanding of art gave us a rich experience. TOUR GUIDE RESPONSE: Thanks so much for your feedback. It was a true pleasure meeting you and spend some hours together. I will be very happy if we stay in touch. All the best! Mila was a fabulous tour guide. She adapted her tour to our group's needs and was engaging. Mila was wonderful and tailored our tour specifically to what we wanted to do. She got us right into the Academia to see David without having to stand in line which was a very very long line. Her English was great and she took us everywhere we wanted to go, recommended a nice spot for lunch and then left us to wander alone for a while which is what we had asked. I would hightly recommend her. Mila was the perfect introduction to Florence for me. She taught me so much about how Florence came to be and showed me quite a bit in our two hours together. She was such a delight, very warm and articulate. She gets and deserves 5 stars in my book! Thank you Mila, you are a Florence treasure! TOUR GUIDE RESPONSE: Thanks so much! It makes me so happy to hear you enjoyed the tour in Florence. I wish you a wonderful stay in Italy and all the best for the future. And, please, contact me if you need any help. My warmest regards! Milas was a great guide! She gave the four of us an informative and candid tour of Florence today and we thoroughly enjoyed her company. We highly recommend her! TOUR GUIDE RESPONSE: Thanks so much! It was a great pleasure for me to spend some hours with you. Please, contact me if you need some information during your holiday. Enjoy your stay at Impruneta! I wish you all the best! TOUR GUIDE RESPONSE: Thank you very much for your wonderful words! I was so happy to meet you and I really hope to see you again here in Florence. In the meantime, I wish you all the best! We loved Mila's tour of Florence. She was responsive to our desires and needs, and so knowledgeable about Florence and the art in the Uffitzi Gallery. I wish there was a Mila in every city. TOUR GUIDE RESPONSE: Thank you so much for your feedback! It was wonderful to spend some hours with all you and I really hope to meet you again in the next future. Let's keep in touch! I wish you all the best! Mila was very knowledgeable, and did a wonderful job of sharing her knowledge. We had asked her to tailor the tour to accommodate an impossible age spread ... from 10 to 74. She made a valiant effort, and we appreciated it very much. However, the even though the day was hot, and the children lost interest fairly early on, Mika continued. The adults appreciated her efforts very much ... the children not so much. TOUR GUIDE RESPONSE: I am sorry your kids didn't enjoy the tour. By the way, I hope you had a very pleasant holiday in Italy. I wish you all the best! TOUR GUIDE RESPONSE: Thank you very much! If you come back to Florence, please let me know. All the best! Mila was attentive, knowledgable, and efficient. She provided us with a wonderful experience in Florence and Pisa. She and her driver were punctual to pick us up at the Livorno Port. TOUR GUIDE RESPONSE: Thank you very much! It's wonderful to hear you enjoyed the day in Florence and Pisa. Let's keep in touch! I wish you all the best! Mila was prompt, very helpful and very knowledgeable. She made our visit to Florence more enjoyable. TOUR GUIDE RESPONSE: I am really happy to hear you enjoyed the tour of Florence. Thank you very much. If you decide to come back, please let me know. I wish you all the best! Excellent tour. Very knowledgeable and friendly guide. TOUR GUIDE RESPONSE: Thanks so much! I really hope you enjoyed your holiday and, if you come back here, please let me know. All the best! If there were a 6th or a 10th star, Mila would merit it. What an OUTSTANDING day! Friendly, incredibly knowledgeable, flexible, energetic and warm, Mila made my family's one port day in Livorno unforgettable. Her excellent command of English enhanced her commentary. From wine-tasting to DaVinci to the best local pizza, Mila managed to point out the unusual and educate while entertaining. I'd recommend Mila highly to anyone traveling in the Tuscany region. TOUR GUIDE RESPONSE: Thanks so much! You are a wonderful family! Please, let's keep in touch and if you need any help, mail me. Really, I hope to meet you again in future. I wish you all the best! Her knowledge of paintings and the history of paintings was amazing. Will never look at paintings the same way. TOUR GUIDE RESPONSE: Thanks a lot! It was a pleasure to meet you and I hope to see you again. I wish you all the best! Mila is a wonderful guide who knows and loves italian art and culture. She has excellent communication skills which made every stop in all pieces of art a moment of magic. We could have spent much more time and still felt that it wasn't enough! We are a group of 7 people with 3 seniors and 2 young kids. Some of us even have walking difficulties. With Mila's help, we were able to see most of the interesting sights in Florence and Pisa in one day. TOUR GUIDE RESPONSE: Hi! how are you? and what about "my" wonderful kids? It was fantastic to meet you and hope you are coming back to Florence. All the best! Mila was wonderful. Because half our party had been to Florence before, we had specific things we wanted to see & do. At the Accademia di Belle Arti (where the famous statue of David is located) she quickly secured our tickets & took us to a preferred entrance for immediate entry. She accompanied us through the gallery providing detailed background at the most interesting spots. Elsewhere she showed herself to be an accomplished historian & critic of all things Florentine. She will NOT disappoint. TOUR GUIDE RESPONSE: Thank you so much for your comment. It was a pleasure to spend the day with you and I hope to meet you again in the next future. I wish you all the best. Merry Christmas! We were thrilled by the excellent tour that Mila provided for us in Florence. She is well informed in both art history and Italian history and explained both to us with enthusiasm. Rating: excellent. TOUR GUIDE RESPONSE: Thanks so much for your words and your kindness! It was a privilege for me to show you the best of Florence. I really hope to meet you again, soon. My best regards. Mila was a terrific guide. The cities were very special and our next time we hope to be able to stay a few nights. With exceptional command of Florence present and past Mila was the best tour guide we have utilized in over 20 plus cruises. She was very flexible and attentive to our interests. She clearly exceeded our expectations. At the end of our tour we felt we had made a new friend. We would highly recommend Mila. TOUR GUIDE RESPONSE: Thanks so much for you comment. It was a privilege for me to meet you all and spend a day with you. Please, let's keep in touch. I wish all the best. Our wonderful guide, Mila, brought the arts and sites of Florence alive for us! TOUR GUIDE RESPONSE: Thanks so much! It was a great pleasure for me meeting you all and talking about Florence. I hope you enjoyed your holiday in Italy and I'd be very happy to see you again. I wish you all the best. My warmest regards. Without Mila the David and the Slaves would have meant nothing to us. Mila brought them to life. At the Uffizi she taught us art appreciation from the 11th century up to the Time of Michaelanglo. She was a WONDERFUL teacher. Both my husband and I loved her and her teaching. We started our tour with Michaelanglo's David and finished with him and his Holy Family at the Uffizi. TOUR GUIDE RESPONSE: Thank you so much for your comment! It was fantastic to meet you and I hope to see you again, here in Florence. I wish you all the best. Kind regards. TOUR GUIDE RESPONSE: Thanks so much! It was a pleasure for me to meet you. Mila was a fabulous guide. She was extremely knowledgeable and seemed to truly love Florence and sharing the city. We had two teenagers with us and Mila explained art and architecture so they understood it and enjoyed it. We recommend Mila to anyone. TOUR GUIDE RESPONSE: Thank you very much! It was a pleasure for me to spend the day with you all. I wish you the best and I hope to see you again. Grazie mille! This was a great tour in an air conditioned van driven by Ricardo. Milo did an excellent job of explaining all of the sights and stops. We had a wonderful lunch in a small Chianti village as the skies openned up with lightening and thunder. A very worthwhile trip. Mila is very knowledgeable but probably too detailed for our grandkids ages 11 and 13. TOUR GUIDE RESPONSE: I wished to show you the best of my town. I am sorry I was too detailed. Mila was very informative and exactly on time. Everything was perfectly organized. My stepdaughter and I took a private tour of Florence with Mila in September of 2012. Despite our limited time, Mila made sure we wouldn't miss the highlights of the city. She was very knowleadgeable and professional and we thoroughly enjoyed her company and guidance. Mila was a very good tour guide on our trip to Florence. She was very informative and showed us all that Florence and Pisa had to offer. My only suggestion would be for Mila to allow us to observe the sites after a brief explanation instead of lecturing so much at each site. TOUR GUIDE RESPONSE: Thank you very much. It was a great pleasure and privilege for me, to spend a day with you and your family. I really hope to see you again. The group really enjoyed the tour and complimented the guide for an excellent service. Thank you and we will most definitely recommend you to other travellers.